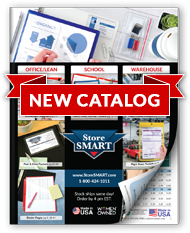 Are you eager to take advantage of StoreSMART's vast array of magnetic accessories, but unable to mount a magnetic dry erase board on your wall? Don't lose hope! If you can find a few feet of floor space, you can use one of our Magnetic Mobile Dry Erase Room Divider. Each durable steel board features a white coating on both sides that's perfect for dry erase markers. (Trust us, you'll never have to worry about scratching, staining, or ghosting). The heavy-duty steel frame resists wear and tear, and the innovative nylon caster design—two swivel, and two lock—offers the perfect blend of mobility and stability. Best of all, there's a ten year warranty on the painted steel board, and a lifetime warranty on the frame. Stop fussing with tape and corkboards, and upgrade to a visual management system that can roll with you! Magnetic steel dry erase board measures 38 ½" x 64". White dry erase painted coating won't stain or scratch. Modern steel frame design has a silver finish. Frame measures 42" wide, 75" tall, 24" deep at the base. Four nylon casters—two swivel, two locking—for ease of movement. Ten year warranty on board; lifetime warranty on frame. Assembly required. Simple instructions included. Note: large, heavy items (whiteboards, utility carts, storage bins, tables, etc.) cannot ship with our smaller, lighter items (plastic pockets, folders, magnets, etc.) They must be ordered separately. Thank you.